Formerly known as Plaisance, Sir Seewoosagur Ramgoolam International Airport-Mauritius is the unique aerodrome of the island.It was built by the British in 1942 and used by the Royal Air Force during the Second World War. After the war, the complex evolved from an aerodrome utilized as an aid to military-sponsored operations to service commercial flights. 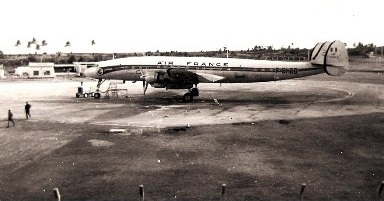 In February 1945 the Réseau de Lignes Aériennes Françaises Libres started a weekly Tananarive - Réunion -Mauritius flight. 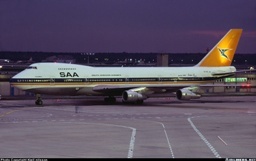 The airline was subsequently acquired by Air France. The British Overseas Airways Corporation (BOAC), now British Airways, started service to the island in January 1962. On the 25-hour flight from London to Mauritius the Bristol Britannia made stops in Rome, Khartoum, Nairobi and Antananarivo. 25th August, 1960 was not a lucky day for Qantas’ fortnightly service from Johannesburg to Sydney with stopover at Plaisance Airport. The Calcined Fuselage of Southern Wave, VH-EAC. Captain E. Ditton of the Lockheed Super Constellation, VH-EAC Southern Wave, aborted take-off due to Number 3 engine’s failure. The manoeuvres to stop the speeding aircraft were initiated too late. The plane skidded on the damp concrete surface and overran the end of runway 14; coming to a violent halt some 100 meters further. Fortunately all 38 passengers and 12 crew members succeeded in evacuating the wrecked plane. Tanks full of high octane fuel were ruptured at the impact and fire soon spread to devour the Super Constellation. 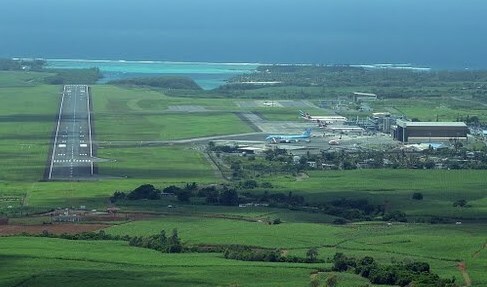 No major accidents involving fatalities have been reported at the airport of Mauritius. However, in the history of the airport’s Air Traffic Control, 28 November, 1987 is an unforgettable date. South African Airways’ Helderberg never reached Mauritius, its enroute stopover. 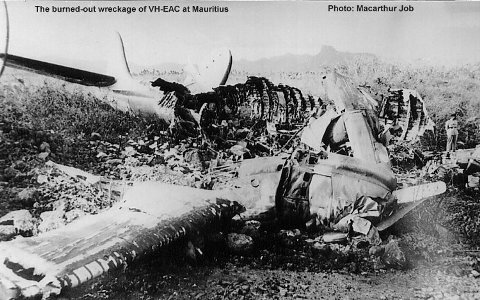 Springbok 295 crashed in the Indian Ocean near Belle Mare Beach, killing all on board. 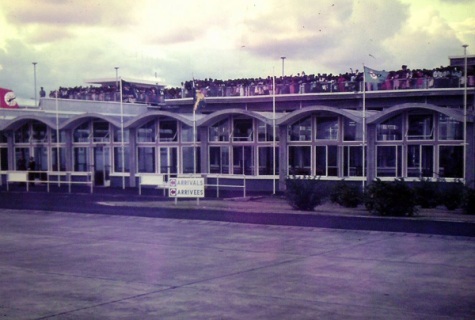 Mauritius’ airport has not only welcomed many delighted visitors, but bid farewell to many Mauritians also. Following our independence on 12th March 1968, fears of bleak economic prospects and racial tensions impelled many to emigrate to Australia. Later youngsters flew with elated hopes, mainly to Britain and France, in the quest for a more promising future. At that time going to the airport to bid "au revoir" to those leaving was an event in itself. Friends, neighbours and relatives - distant as well as near – would turn out by bus-load. The severing of cocooned family bonds and friendship was characterised by shedding of heavy tears and incessant embracing as check-in time was approaching. Today modern Mauritius' Airport is geared to accommodate wide-bodied commercial aircraft as well as private jets and a new terminal was added to the actual wing to cater for projected increase in passenger flow. Over 2 million passengers transited through the airport in 2014. 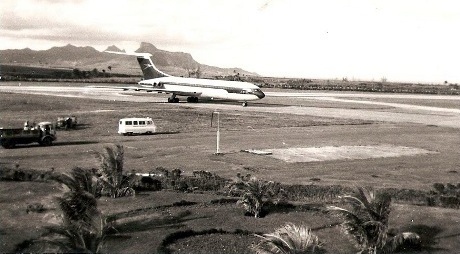 In 1987 the airport was named Sir Seewoosagur Ramgoolam International Airport,SSRIA, in honour of the first post-independence Prime Minister of Mauritius. SSRIA is located at Plaisance near Mahebourg and about 50kms from Port Louis, the capital.